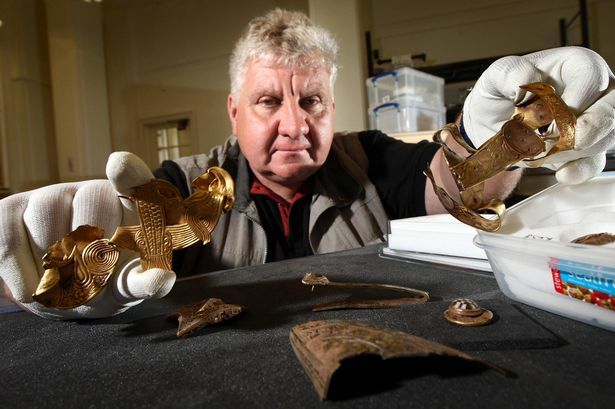 Iconic pieces of the world-famous Staffordshire Hoard are set to be brought to life by new technology at a gallery dedicated to the treasure at Birmingham Museums and Art Gallery. The 1,400-year-old pieces of gold and silver will be illuminated with microscopes, touch screens, videos and a recreated Mead Hall which will open to the public on Friday. The historic pieces, such as the folded cross, the Millefiori stud and sword pommels, will be housed in display cases at the Staffordshire Hoard Gallery – where the Crown Jewels would not look out of place. Exhibitions manager Andy Horn said that staff have dubbed the room ‘the bling zone’. The permanent gallery, developed with the help of a £700,000 Heritage Lottery Fund grant, is aimed at a variety of people from archeology enthusiasts and students to curious families and school parties. A total of 1.5 million people have seen the Hoard since it was discovered in a farmer’s field five years ago. The touch screen table will allow visitors to see computer images of individual items, rotate and enlarge them and find out more detail about how they were made and what they were used for. While displaying a broad selection of the 4,000 pieces of Anglo-Saxon treasure, the new exhibition also details how they were made with a selection of tools and videos showing metalworking methods. Meanwhile, youngsters can dress up in Anglo-Saxon costumes and take lessons in olde English while sitting in a replica of a Mead Hall – the kind of room where a 7th century Lord and his warriors would have enjoyed supper. The Hoard was found by metal detectorist Terry Herbert in a farmer’s field near Hammerwich, Staffordshire in 2009 and is Britain’s largest ever treasure case. Admission to The Staffordshire Hoard Gallery at BMAG is free.